13' 5" x 11' 8" (4.09m x 3.56m) Front aspect walk-in bay window. Feature fireplace, radiator, part-glazed French doors into lounge/diner. 19' 3" x 10' 7" (5.87m x 3.23m) Rear aspect windows and French doors to rear garden. Feature fireplace, radiator, wall lighting. 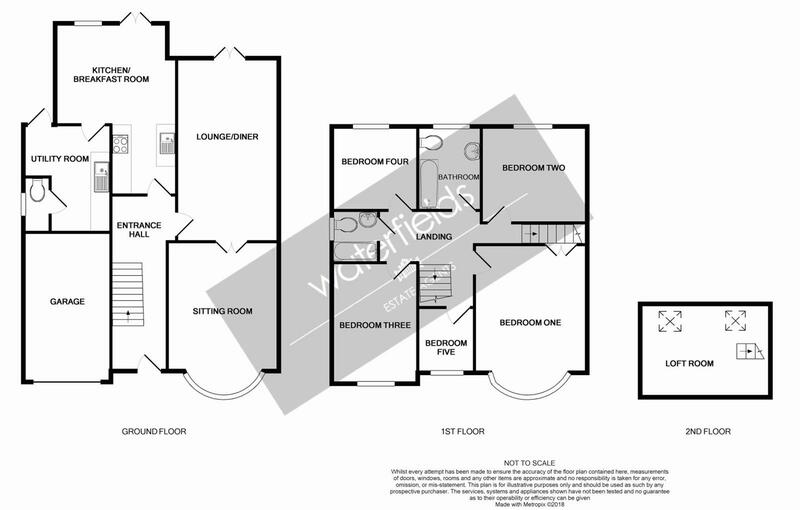 11' 7" x 10' 7" (3.53m x 3.23m) Dual aspect with side and rear aspect windows and French doors to rear garden. Comprises of a range of eye and base level unit with roll edge work surfacing and tiled surrounds, space for range cooker with extractor over, inset stainless steel sink and drainer with mixer tap, space & plumbing for dishwasher, space for table and chairs. 11' 3" x 9' 2" max (3.43m x 2.79m max) Rear aspect door to rear garden. Roll edge work surfacing with inset stainless steel sink & drainer with mixer tap, space and plumbing for washing machine & tumble dryer, wall mounted boiler, space for fridge freezer, tiled flooring. Low level w.c., tiled flooring. Staircase to second floor, doors to all rooms. 13' 5" x 11' 8" (4.09m x 3.56m) Front aspect walk-in bay window. Radiator, under-stairs storage cupboard. 10' 9" x 10' 7" (3.28m x 3.23m) Rear aspect window. Radiator, built-in wardrobes. 12' 7" x 9' 2" (3.84m x 2.79m) Front aspect window. Radiator. 9' 2" x 8' 8" (2.79m x 2.64m) Rear aspect window. Radiator. 7' 6" x 7' 2" (2.29m x 2.18m) Front aspect window. Radiator. Rear aspect window. Comprises of panel enclosed bath with mixer tap and shower attachment, low level w.c., bidet, pedestal wash basin, heated towel rail, part-tiled walls, stripped wooden flooring. Side aspect window. Comprises of a panel enclosed bath with mixer tap and shower attachment, low level w.c., wall mounted wash basin, heated towel rail, fully tiled walls, stripped wooden flooring. 13' 5" x 9' 8" (4.09m x 2.95m) Two Velux windows. Eaves storage, radiator. Driveway parking for several vehicles leading to integral Garage with folding wooden doors, herbaceous borders. The rear garden is a real feature of the property and is south facing. Comprises of a paved patio with the remainder mainly laid to lawn, enclosed by wood panel fencing, herbaceous borders and mature trees, greenhouse, to the rear is a workshop/office with light & power, outside tap.